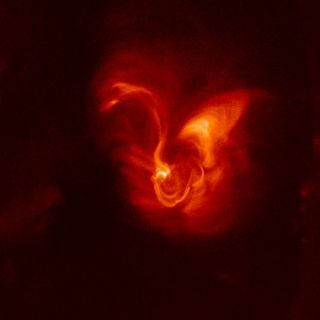 Taken with Hinode’s X-ray telescope, this image shows details of magnetic field structures along an active region of the Sun. Like cosmicrubber bands, twisted magnetic structures along the Sun's surface can release massiveamounts of energy when relaxed. The discharge could be the "hidden" source thatheats up the atmosphere of the Sun. Thefindings, presented today at a NASA Space Science Update in Washington D.C., come from images taken by the X-ray telescope (XRT) aboard the Japan Aerospace ExplorationAgency's satellite, Hinode. Formerly known as Solar-B,Hinode (Japanese for "sunrise") was launched on Sept. 22, 2006 on a three-yearmission to study the Sun. While the Sun'ssurface is a steamy 10,000 degrees Fahrenheit (5,538 degrees Celsius), gasfloating above in the so-called coronasoars to more than 100 times hotter. Astronomers have long puzzled over thesource of the corona's heat. Hinode'stelescope imaged the million-degree gas spiraling up from sunspotsas well as the corona gas in the Sun'satmosphere. The pictures revealed twisted and tangled magnetic fields thatcould give this hot outer layer a jolt of heat. The arcing magnetic structuresstore huge amounts of energy, which they can release when they unwind intosimpler configurations. The astronomers suggest the released energy heats upthe corona and powers solareruptions and coronalmass ejections. "Theoristssuggested that twisted, tangled magnetic fields might exist," said studypresenter Leon Golub, senior astrophysicist at the Harvard-Smithsonian Center for Astrophysics. "With the XRT, we can see them clearly for the first time." Along withthe X-ray telescope aboard Hinode, the Solar Optical Telescope (SOT) willprovide images of features on the Sun's surface, while the Extreme UltravioletImaging Spectrometer (EIS) can track charged solar material as it moves around.Together the trio is expected to help astronomers understand and forecast solarflares and other types of space weather.